How to get good LORs? How to get good LORs? – Get insider tips on what makes for a good LOR and how to get one from your recommenders. Do not ignore the importance of LORs. This is fourth article in this series. See the previous article on GRE here, School Selection here and SOP here. Remember we were discussing the key documents in last article and we discussed the matter that goes into SOPs. Now is the time to discuss how to get good LORs. LOR is the only place where a third person can help strengthen your application and you can use it to your advantage. Sometimes, a LOR alone from a highly regarded Professor can get you admitted even if rest of the application was average because LOR is that unbiased external perspective on your candidacy that the school can use to evaluate your profile and if it comes from a credible source, then the schools can place high weight on it. As such, LORs can be more important for PhD applicants in vouching for their ability to research. Lets come to the basic points. All universities usually ask for 3 LORs – and you can choose who to get them from. A good LOR is one that validates your candidacy by sounding genuine, vouching for your ability to excel at your target program and coming from someone who is credible. Who should you get your LOR from? This is very important factor and since you have a choice here, make sure you understand the difference it can make. Ideally, you would want to choose an internationally known Prof whom the schools can trust and who is ready to vouch for you! But its easier said than done and in 95% cases, its hard to find such a perfect recommender. So, next, you can look for someone who is better regarded (HOD vs an Associate Prof for example) and with whom you have worked closely. If you can find someone like this, then just go for them. Understand that people at higher positions are expected to connect with more number of students and therefore their evaluation can be more trustworthy as they will judge you against a broader pool. As such, their evaluating in ‘top 5% people I have interacted with’ holds more weightage than a lower ranked person’s ‘top 2% people I have worked with’. Now, if you need to find another recommender and dont have much choice left, go for people who know you better and will sound genuine. The mistakes that students make sometimes is that they take LORs from HODs or Deans even if they haven’t really worked with them. Now although the person has more credibility in general, he cannot be trusted to know the student personally and as such, any recommendation from him will lack the substance. As opposed to it, it may be better to get LOR from someone who knows your work better and regards it highly even if he doesn’t have a fancy title. If you are presently working, you could get one LOR from your project manager/lead depending upon whether you think he can add value to your application. The longer you have worked, better it is to ask your manager as they are more up to date on your skills and accomplishments. Sometimes, people still choose to get LOR from college Professors if they have been working less than 2 years as they dont feel comfortable disclosing their MS plans to their employer – this is fine as MS do not require professional LORs per se anyways. Other factors to consider may be the ability of person to express since his views need to be conveyed properly to make an impact. Even if he thinks highly of you but can’t convey it nicely, it may jeopardize your chances. In case you are applying for PhD, getting a LOR from someone in your desired area of research can matter more. You should get at least one LOR that evaluates your research skills. So, choose your recommenders accordingly. Professors who are used to writing LORs can do the job on their own upon your request but you can still give them inputs on things that might matter for you. For eg. you can provide them details on what you have been working on and what is your proposed area of study so that they can talk about that in the LOR. Remember that these people are busy, so you will need to follow up and help them help you. Sometimes recommender might ask the student to draft a letter that they can then modify. This is perfectly acceptable but students should take care that the letter gives the perspective from the recommender and not feed praises for the sake of it. Try to provide only partial drafts and have them write the meat of it so that the letter has a unique voice. If you end up writing full drafts for every recommender, they could sound all same. So, that’s it about the LORs. Always, remember to keep recommenders updated on the schedule as you don’t want to miss the deadlines if they end up going on vacation in the last minute. Next, you should be building an impressive resume, check out our guide and template here. 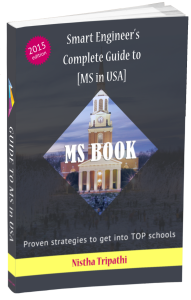 For specific LOR tactics, check out our bestselling MS Book: Smart Engineer’s Complete Guide to MS in USA. For our paid professional counseling, check out our counseling packages. Would be grateful for respones. Thanks a lot Nistha for making my dream of attending world’s most prestigious telecom program come true. It would not have been possible without your guidance. I am working with Scholar Strategy (Nistha) on my MS applications for last 2 months. It was a pleasure to work with Nistha. She is quick in responding to my queries and have provided comprehensive guidance in writing SOP, resume and other necessary documents. She is always available on phone and emails and her tips have been beneficial. The essence of any SOP is your story that you want to convey the admission committee and Nistha helps in bringing out the same. Through Scholar Strategy I was able to stay focused and up to the mark with my MS applications.